In this article we’ll see you how to use image buttons and how to use toast and create custom toasts in your application. Now toast has nothing to do with toasted bread, it is in fact a popup. It’s a popup of information. For example if you click on a button it may tell you an operation has occurred. A good example of a toast would be when you’re on Xbox live and a message pops up telling you your friend is online. See http://developer.android.com/guide/topics/ui/notifiers/toasts.html for an explanation from the Android Developers site. Ok for this tutorial I will create 5 image buttons. 4 will change the background of the screen and also pop up a toast and the remaining image button will exit the application. Without further ado, let’s start the project. Open Eclipse and create a new Project. Name it Application2. Name your main Activity Application2Activity. Notice I have placed several images into the drawablw_hdpi folder. For this tutorial you will have to obtain 09 images. You will need an empty room image, 4 different living room images, an exit sign image and also an image of the number two, three and four. The ic_launcher image will already be in that folder when the project is created. Save the images as .png and put them in drawable-hdpi folder. Note for beginners: If you have trouble finding your folders to save the images, an easy way to put the images in that folder is to copy them from where you have saved then right click on the drawable-hdpi folder in the Eclipse folder structure as seen above and select paste. Right we are ready to get coding. 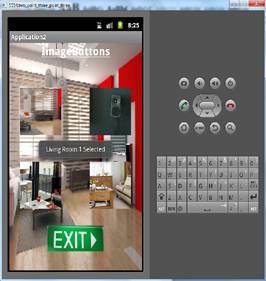 Figure 4: ImageButton Btn_living_room1 clicked and toast displayed. 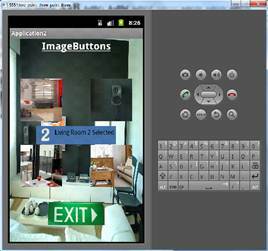 Figure 5: ImageButton Btn_living_room2 clicked and custom toast is displayed. 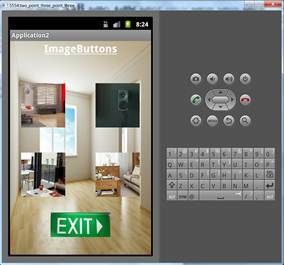 Figure 6: ImageButton Btn_living_room3 clicked and custom toast is displayed. 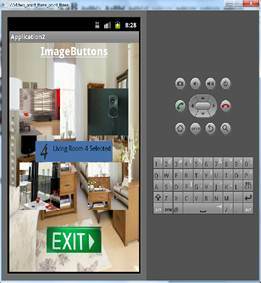 Figure 7: ImageButton Btn_living_room4 clicked and custom toast is displayed. Firstly we’ll look at some of the code in the main.xml file. We used a Relative layout. Best to mess around with this in the GUI interface but it’s useful to go into the code if the components become difficult to manage onscreen, i.e. too many components on screen or they won’t go where you want them to. There are several layouts you can use but for this article I thought it would be a nice touch to introduce a new one to you. Notice we give it an id so we can change the background later and also notice I use an empty room image as a background. Notice this ImageButton android:layout_above="@+id/Btn_exit2"etc. With relative layout components positions are relative to other components. Also notice android:src="@drawable/living_room3". This assigns our image button with the desired image. The custom_toast.xml basically defines what your custom toast will look like. This can be used for multiple toasts. Here I gave it a blue background: android:background="#4672AA"
From this article you should now be familiar with the use of image buttons, toast messages, creating custom toasts and using a relative layout. I hope this article has been useful to you. If you enjoyed it or got any help at all from it just give me a like. Thanks for reading. Catch you next time. Has designed and developed several android applications from scratch which are available on Google Play.